The filters of your HVAC system at home needs regular maintenance. At times, cleaning should be enough to make it function like brand new again. There are also times when it must already be replaced. It is best to call a professional HVAC contractor like Eggert Cooling & Heating Solutions to assist you on services related to your cooling and heating equipment's filters. 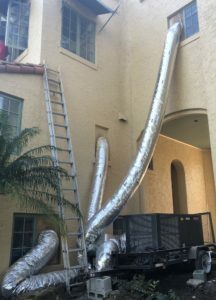 We have a team of experts who can help you determine whether cleaning and maintenance should be enough or if the filters of your HVAC system should already be replaced. Maintenance of these filters is highly important because they help keep the air circulated around your home or place of business clean. When dust and other germs accumulate in these filters, they can spread allergens and even diseases around your household. Furthermore, these filters should be cleaned to help keep energy costs low. Dirty filters will cause your HVAC system to work double time hence requiring more energy. Additionally, clean filters can help optimize and maximize the lifespan of your cooling and heating equipment. When these filters are cleaned properly, damage can be prevented as well. Eggert Cooling & Heating Solutions is a top contractor offering service and maintenance for your HVAC filters. We offer repairs, replacement, and more. Our team of experts is here to assist you! We are available in Clermont, Orlando, Apopka, Windermere, Maitland, Lake Mary, and nearby communities in the Central Florida area. You may call us at 407-252-3785 for a free quote.